A dual-payload success for Europe: Arianespace’s Ariane 5 gives a “lift” to the THOR 7 and SICRAL 2 satellites. Arianespace extended Ariane 5’s track record of success with another heavy-lift mission performed today from the Spaceport in French Guiana, which launched a mixed payload of commercial and military telecommunications satellites – THOR 7 and SICRAL 2 – for European operators. 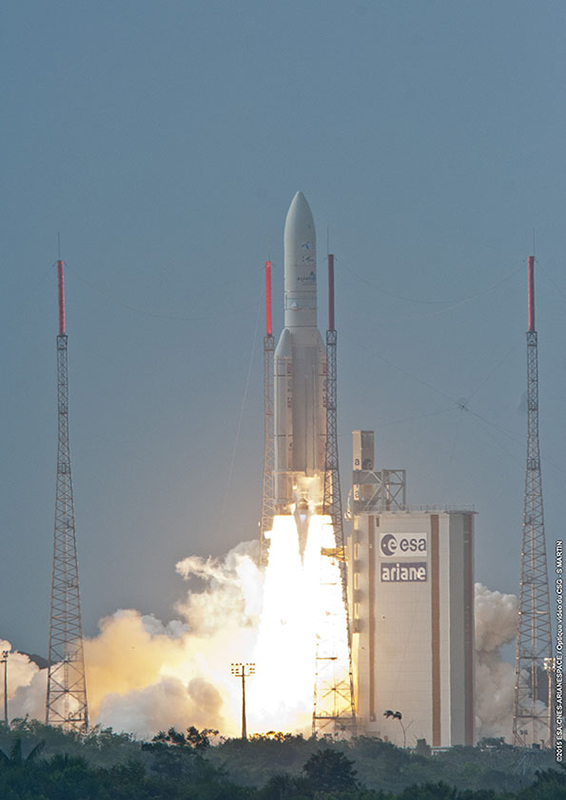 Arianespace's April 26 success with Ariane 5 marked the heavy-lift launcher’s 78th flight from French Guiana. Both spacecraft were deployed following their ascent from the Spaceport’s ELA-3 launch zone, with THOR 7 released some 28 minutes after liftoff, and SICRAL 2 separating approximately six minutes later to complete the flight sequence. Ariane 5 delivered an estimated total lift performance of 9,850 kg., including its two passengers and hardware for the launcher’s dual-payload deployment system. This mission – designated VA222 in Arianespace’s numbering system – was the 222nd launch of an Ariane-series vehicle since 1979, and the 64th consecutive success for Ariane 5, as well as its 78th flight overall. During post-launch comments at the Spaceport, Arianespace Chairman & CEO Stéphane Israël said the company was proud to have successfully implemented a dual launch solution serving both private and public entities, and addressing both civilian and military applications. THOR 7 was built by SSL (Space Systems/Loral) for operation by Telenor Satellite Broadcasting, a major European satellite provider of broadcast and data communication services for customers in the broadcast, maritime, and oil and gas markets. To operate from an orbital slot at .8 deg. West longitude, this spacecraft will serve the maritime sector – offering high-powered coverage over the North Sea, the Norwegian Sea, the Red Sea, the Baltic Sea and the Mediterranean. A Ku-band payload for broadcast and television services in Central and Eastern Europe also is incorporated in the relay platform. After THOR 7’s separation was confirmed, Israel took the opportunity to thank Telenor for entrusting its latest satellite to Arianespace and its workhorse Ariane 5. SICRAL 2, the second payload deployed by Ariane 5 on today’s mission, is a military telecommunications satellite designed to provide strategic and tactical telecommunications links for French and Italian military forces, as well as reserve capacity for other NATO nations. To be operated from an orbital position of 37 deg. East, SICRAL 2 was developed in the framework of a turnkey contract that the Italian Defense Ministry and the French DGA armament agency (Direction Générale de l’Armement) have with Thales Alenia Space Italy. Telespazio, among other things, was responsible for the launch service. “Ariane 5 has played again a key part in the strategic partnership set up by Italy and France to develop a common policy regarding European security,” said Israël. With today’s success, Arianespace has conducted three launches from French Guiana so far in 2015 – each with a different member from the company’s launcher family, in which Ariane 5 is joined by the medium-lift Soyuz and lightweight Vega. This pace keeps the company on track to meet its target of 11 missions during the year, based on the availability of payloads scheduled for these launches. The next Arianespace mission is planned for May, using another Ariane 5 to orbit the DirecTV-15 and SKY Mexico-1 satellites.